Forget the gruel implication of hearty soups; these recipe suggestions are delicious, nutritious and they look good too! Quantities below for this cream of vegetable soup serve four. It only takes a short time to prepare and freezes well. Prepare the vegetables by washing, peeling-or scraping- as necessary and finely dice them so they are all of a similar size and shape. Melt the butter in a large pan and gently fry the diced vegetables for approximately 10 minutes before stirring in the flour. Slowly add the stock and seasoning (salt and pepper if desired) then simmer for a further 15 minutes. Add the milk and continue stirring. Take a ladle full of the soup and add to a bowl containing the cream, blend together, then return to the soup pot. Heat gently and stir. This creamy vegetable soup can be served straight away with warm, crusty rolls. A sprinkling of fresh chopped parsley and a few croutons can be added. The recipe can be adapted to suit other combinations of vegetables such as: celery with onions, watercress and potatoes, or, on their own; spinach, mushrooms, parsnip and artichoke. Chowders are between a soup and a meal, with fish or clams as the main ingredient, while bisque refers to thick soups that contain shellfish. These feast of fish soups look amazing and create a substantial dish that is fit for any occasion. 450g fillet of white fish-haddock or cod are good and smoked is even better! Simmer the fish in the water for about 10 minutes. Strain the liquid into a bowl (this is your fish stock) and flake the fish, removing any bones and skin. Melt the butter in a large pot and gently fry the onion until it looks transparent. Stir in the flour to make a roux. Slowly add the strained fish stock and stirring constantly, bring to the boil. Now add the diced potatoes and simmer for 10-15 minutes. Add the corn kernels and flaked fish-looking out for any bones you may have missed. Heat for 5 minutes. Using a ladle, take out some of the soup and add to a bowl containing the fresh cream. Stir the combined liquids gently then put this liaison into the soup pot and heat without boiling for 2-3 minutes until ready to serve. This hot and spicy meal in a bowl is easily adapted to make a less fiery, or vegetarian, choice. It is great served with poppadoms or garlic naan breads, with small bowls of crispy bacon and rice, and sliced hard-boiled eggs, for people to add as they wish. For an extra fruity taste, add 2 tablespoons of mango chutney and a dessert apple, peeled and finely chopped. A squeeze of fresh lime or lemon juice makes a good addition too. For a hotter soup, add dried chopped chillies or a teaspoonful of chilli powder. Melt the butter in a large pan and gently fry all the vegetables and fruit (including mango chutney if used) for about 15 minutes. Stir in the flour and curry powder and combine the mixture well. Add tomato puree and continue to stir. Your soup base will look a lovely rich colour now and smell wonderful! Slowly add the stock, stir well so that there are no lumps left, and reduce the heat so the soup simmers gently for about 40 minutes. Season to taste. 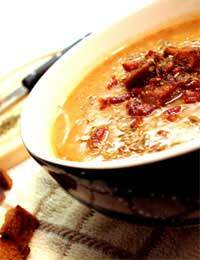 Allow the soup to cool slightly then whizz it through a liquidizer or food processor. That’s it! Serve as hot, fruity and substantial as you like and enjoy your own version.